The JL Audio TR525-CXi system features 5.25-inch (130 mm) woofers with mineral-filled polypropylene cones, long excursion capabilities and stamped steel frames. The woofer design benefits from JL Audio’s vast woofer design experience and advanced modeling systems. Speaker grilles are included, each consisting of a black grille tray with satin silver accents and a black steel mesh grille with an electroformed JL Audio logo. The Evolution TR systems have stood the test of time by delivering unsurpassed value and performance in their price class. You need great speakers to turn the audio signals from your car stereo into music. The Evolution™ TR series speakers take advantage of JL Audio’s extensive research and obsessive testing to deliver excellent performance at prices any audio enthusiast can afford. 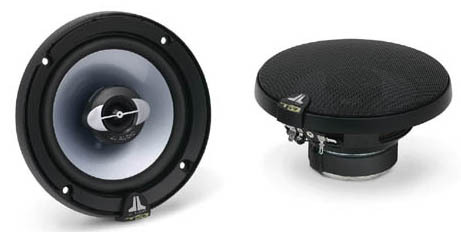 Evolution™ TR speakers come in a wide range of sizes so you can improve the sound in almost any vehicle. JL Audio TR525-CXi 5-1/4″ speakers use mica-filled long-excursion polypropylene woofers for enhanced mid-bass response that’ll really fill out your drums and bass. The 1/2″ woven textile dome tweeters broadcast all the little details that bring your music to life. Ferrofluid cooled tweeters and butyl rubber surrounds mean that these speakers will bring you great music for many years to come. – Recommended Amplifier Power (RMS) 10 – 75 W / Ch.